Pieter, a non-profit organization providing classes, workshops, events, and rehearsal space for body-based practice in Lincoln Heights, is excited to announce that out of 34 remarkable candidates, the awardees of the inaugural Pieter Dancemakers Grant are Maya Gurantz and Julie Tolentino. The Pieter Dancemakers Grant gives woman-identifying choreographers over 40 visibility, credit and support. Women in American culture are frequently socialized to be in supporting and submissive roles to men, feel ashamed of their bodies, and to not embrace wisdom and strength in age. Often, it is men who are supported financially and culturally to make dances as well as are the ones chosen to be in roles of power as presenters, curators, and funders. There are a wildly disproportionate number of male choreographers in the current legitimized dance canon, narrowly representing the bodies and ideas that populate and sustain the field. Pieter’s Dancemakers Grant aims to subvert the discriminatory hierarchical pyramid model of dance in America. Rather than squeezing people and their ideas up into the narrow point of a triangle, this grant supports a wider, verisimilar, and with loving-kindness representation both internally and externally of the amazing things the human body can be and do at all stages throughout a life. 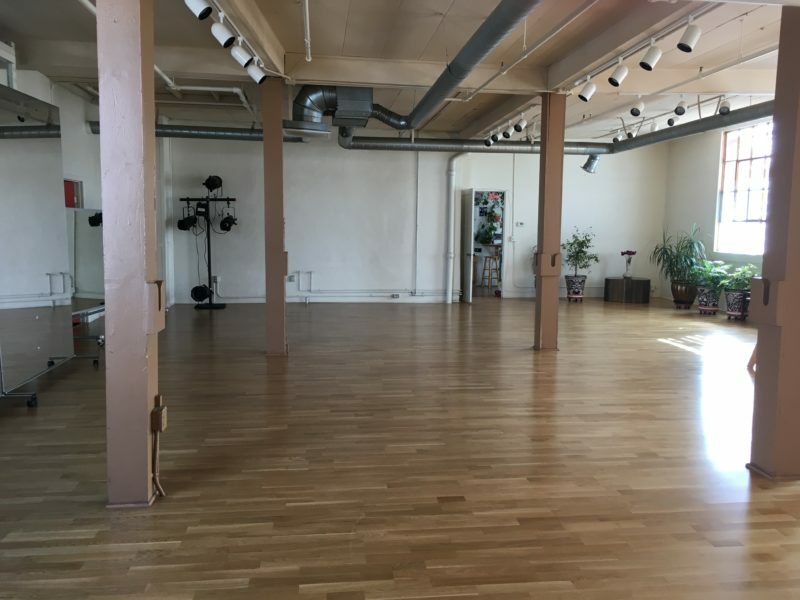 Located in Lincoln Heights, Pieter Performance Space provides the Los Angeles dance community a platform to exchange resources and information with each other and the broader dance world. Pieter is a 501(c)3 non-profit organization that provides a space for dancers to create a nurturing society. Based on holistic support for all bodies, an open exchange of ideas and a reciprocity of generosity, Pieter is a place to be comfortable in the body-mind-spirit. Through workshops, classes, public performances and residencies, dancers work and play together in a non-hierarchical environment. Ideas are embodied, exchanged and transformed rather than owned. There is a belief in abundance and goodness. There is a belief that everyone has something to give. At Pieter, brave dancing bodies are at home. Maya Gurantz (b. 1977, Oakland, CA; based in Los Angeles). In performance, video, installation, social practice and writing, Maya interrogates social imaginaries of American culture and how constructions of gender, race, class and progress operate in our shared myths, public rituals and private desires. Cycling between intuitive and academic research, the intimately personal and political, Maya adapts, re-enacts, fictionalizes, and re-choreographs history to force viewers to encounter, viscerally, how their most intimately held beliefs belong to a complex lineage of social construction. Most recently, Maya’s work has been shown at the Grand Central Art Center (solo), Museum of Contemporary Art Denver (solo), Greenleaf Gallery (solo), Utah MoCA, the Oakland Museum of California, Pieter PASD (solo), High Desert Test Sites, Navel LA, Angels Gate Cultural Center, Beaconsfield Gallery Vauxhall (curated Jane Mulfinger), Autonomie Gallery, and Movement Research at Judson Church, among others. Recent social practice commissions include A Hole in Space (Oakland Redux) for The Great Wall of Oakland (with Ellen Sebastian Chang), The Field Experiment ATL, and Gunworlds (with Liz Goodman, Media Design Practices Summer Research Residency, ArtCenter College of Design). Maya’s writing has been published in The Los Angeles Review of Books, This American Life, Notes on Looking, The Frame at KPCC, ACID-FREE, The Awl, InDance Magazine, Theater Magazine, and an anthology, CRuDE, published by the École Nationale Supérieure d’Art, Bourges. She co-translated two novels by Israeli writer David Grossman, Be My Knife and Someone to Run With, for Farrar Straus & Giroux. Maya holds a B.A. from Yale and an M.F.A. in Art from UC Irvine. This year’s panel consisted of three woman-identifying choreographers over 40 who do not live in the applicable area: luciana achugar, Linda Austin, and Leyya Tawil. luciana achugar has been making work in NYC and Uruguay independently and collaboratively since 1999. Her work is concerned with the post-colonial world, searching for an undoing of current power structures from the inside out. She is a two-time “Bessie” Award recipient and one time nominee; an Alpert Award Grantee; a Guggenheim Fellow, Creative Capital Grantee and a Foundation for Contemporary Arts Grantee, amongst other accolades. Her new work Brujx will premiere at NYU’s Skirball Center of the Performing Arts in October 2018. Linda Austin, Founding Artistic Director of Performance Works NW in Portland, Oregon, is a choreographer and performer whose trajectory began as part of NYC’s East Village performance scene of the early 1980s. Her most recent honor is the 2017 Foundation for Contemporary Arts Merce Cunningham Award, and she is currently working on a solo titled Ordinary Devotions. Two grants of $7000, will be awarded each to Maya Gurantz and Julie Tolentino, in addition to 50 hours of studio time and an option for public programming at Pieter. Gurantz and Tolentino will select a three-month period – between July 2018 and July 2019 – to use the allotted 50 hours of studio space. Using the 50 hours of studio time at Pieter is required as part of the grant package though the public programming is optional.